It was a Monday afternoon, when I first met him in a park near the University of Meridell. It was a wintery day, as wintery as it gets in Meridell that is. The breeze that day was chilly, and I had on my red hoodie to take the edge off. I was sitting in the park working on my notes for an exam that Wednesday. I find being outside helps me to concentrate, the fresh air and soft sounds of nature make me feel at ease. I wasn’t prepared for the exam, neither was I prepared for Westron to come bumbling into my life. I was lazing on a grassy bank, notes spread about me, debating internally on where I should begin, when I heard a strange sound behind me, I turned to see what had caused it. There was a tree nearby and from the base of it I could see a sneakered foot poking out from behind. I knew at that point someone was spying on me. I turned back to my notes. I needed to concentrate. I needed to ace this exam and that was looking less and less likely. I heard a twig snap behind me. I span around. The owner of the foot had evidently stepped out from behind the tree. He stood there, looking at me sheepishly. I expected him to be embarrassed by being caught, but he strode over to me confidently. "Hi there!" He said jovially. I looked him up and down, he was a short pirate krawk, with mischievous eyes, he wore a grey peacoat and tatty jeans. Under the peacoat he was wearing a white shirt with a golden bow tie. I looked at him incredulously. Didn’t he know how out of fashion bow ties were? I turned back to my notes. "I said 'hi'." he repeated, tapping me on the shoulder as he reached me. I turned and glared at him. This didn’t seem to put him off as he continued to introduce himself, "My name is Westron." he said, extending a hand. I took the hand and shook it, my grandmother had always taught me that manners were free, but also priceless. "Janurae." I offered, by way of a greeting, I hoped my blunt tone would persuade the krawk that I was busy and cause him to leave me alone. No such luck. He took me offering my name as an invitation to sit down alongside me. I sighed and picked up some of my papers, he didn’t move. I resigned myself to the fact that this krawk was not very socially adept. I was going to have to make this very clear to him. "I'm studying for an exam Wednesday." I stated. "Ah, cool," he replied, "You up at the University?" "Yes, and I really must concentrate." I said bluntly, hoping that the hint was obvious enough this time. He looked at me wide eyed, "I could help?" He offered, "What's the test about?" I shook my head, "It's an exa-"
"What's the difference?" He interrupted, "Test, exam, it’s the same thing, just a fancier word." "It's not the same at all, a test is..." I faltered, I knew there was a difference, I just couldn’t explain it, besides why should I have to waste my time trying to clarify the subtle idiosyncrasies between the two for him, I had more pressing matters. The krawk grinned at me, "You don't even know, do you?" He laughed. "The difference between an exam and a test is mostly in the usage of the terms. Test and exam are most of the times used as synonyms. That is not completely wrong, as in the field of education, a test is a series of questions, which measure the knowledge of the student on a particular lesson. Exam is a more formal form of test, which measures the knowledge of a student on a number of lessons. As you can see, in the educational field, both are inspecting the knowledge of the student. However, depending on the seriousness or the formality of the examination you have to use the two words appropriately." I gawked at him, he was deceivingly clever. "So, you know already." I stated. "Yes, of course I do." He replied, "I also go to the University." He winked at me. I groaned, I should have known, it wasn’t common for neopets our age to be living in Meridell, not unless they were students at the University. "So, where do you come from originally?" He enquired. "You don't talk much, do you?" He observed. "Sorry, I just really need to get on with this." I apologised, glancing back at my notes. "I know what it's like y'know." he said. I stared at him, how could he possibly know what it was like? He must have seen the incredulous look on my face, because his features softened and he asked, "Want to talk about it?" 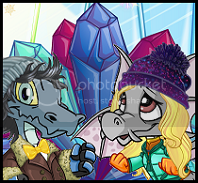 I sighed, I didn’t like to talk about myself very much, especially not to strange neopets in the park, but something about his kind face made me feel I could trust him. "I moved out a few years ago," I said slowly, gauging his reaction, he smiled encouragingly so I continued. "It’s a long story." Westron wiggled his behind on the grassy bank, as if settling in for a long bedtime story. So I took a deep breath and began my tale. "I never really got on with my mother, others used to say we were too alike, that we were bound to clash. As I got older our arguments got more frequent and by the time I was in my last year of school, I could barely concentrate on my studies, y'know, because of the friction between us. So I made the decision to go it alone, I moved into a tiny little hut in Tyrammet, it was horrible." I paused, Westron was hanging on my every word, so I continued. "The hut was small and damp and smelly, the neighbourhood was dangerous, more often than not I'd wake up in the middle of the night, scared and wanting to go back home. I barely had enough neopoints to keep a roof over my head, I had nothing to buy food with, so every day I trekked up to the giant omelette and took a slice. My hut was robbed several times over the two years I lived there." Westron was staring at me in awe, he urged me to continue. So I did. "I couldn't concentrate on my studies, and I ended up in a worse position than I had been at home. My grades were slipping and I knew I needed to do something. But my mother was adamant that I wasn’t going to be allowed back in her home, she had taken it as a personal slight that I had left in the first place. So I struggled along for two years, I finished school, with poor grades, but better than a complete fail I suppose. After school I found a job at Tyrannian Foods, I worked every hour I could get." Westron looked stunned, his mouth was hanging open, "Wow," he said, "What happened next?" "I worked hard and saved even harder, eventually I had scraped enough neopoints to come to Meridell, and after several weeks of applying for various courses, I got accepted at the University." "I'm so sorry." he said. "It's ok, you couldn’t have known." I replied. "I meant, I'm sorry for what I said before, about knowing what it's like." he looked embarrassed. I sighed, I was used to people not getting it. I mean it's not very often you meet a neopet whose own mother couldn’t put aside her own pride, to help her struggling daughter, who had spent years to get to the point in life where she felt worth something. "So you see," I explained, "because of my previously bad grades, I have to work extra hard, to prove to the professors, that they made the right decision in letting me join the University." "Well, in that case we'd better get to work on preparing you for that exam!" Westron exclaimed. So we spent the rest of the afternoon nestled on the grassy bank together, reading through my notes, Westron occasionally testing me on some aspect of theory, or questioning my opinion on something to ensure I had understood it fully. By the time the sun was setting we were fast friends. And I felt much better about the looming exam. Westron walked me back to my dormitory. "Thank you so much for helping me revise today, I couldn’t have got through as much as I did without you." I smiled at him. "Call me Rae." I said. "OK, Rae, have a good night, see you tomorrow." He waved goodbye and set off down the hallway toward the dormitory for the second year students.